← Doggie Tonsillitis, Strep Throat, Or What? 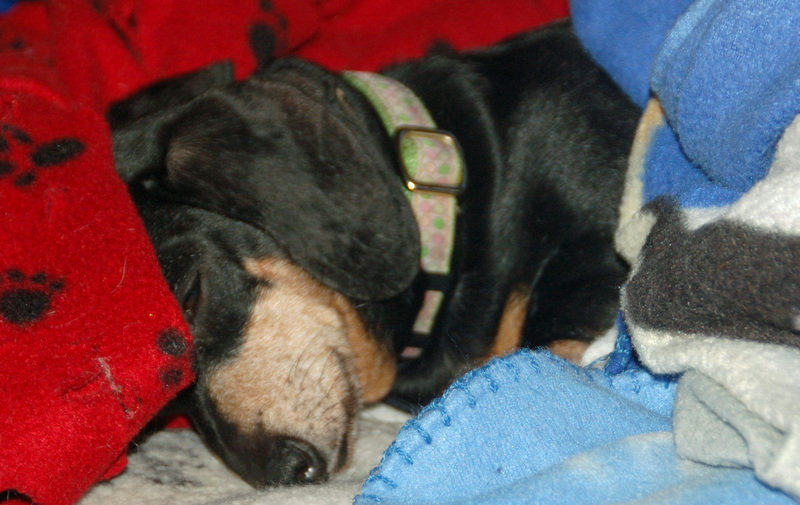 Windy enjoys an afternoon snooze on fleece blankets. The creeping dog crud has infected the house. Windy is not feeling well and will be going to the veterinarian today. Yesterday she started feeling listless and tired. She woke up whimpering—not rolling over onto her back, thumping her tail and wanting a belly rub. She did the same thing this morning. Last night when I came home she did not come to greet me. She did not want a walk with Jake and Hope yesterday afternoon. When your dog has a distinct behavior change that lasts 24 hours, it is time to think about going to the vet. Windy has been eating. I haven’t seen any vomit or weird poop. She is urinating normally. At night, Windy and Hope are practically glued together. Could Hope have passed some germs to Windy? Jake is acting normally. At least my vet is making out like a bandit from all the visits within the last eight days.